Thanks for a great challenge last week, your Sweet Treats cards were fun! Our sponsor last week was Michelle Perkett Studio & we have prize a winner drawn by InLinkz to announce, congratulations Carol it’s you! This week we challenge you to make Any Hero Christmas cards! An Any Hero Christmas card would be a Christmas card you make to send a hero, be sure to write a personal note inside too! I can’t wait to see your card creations! Our sample card maker this week is Antoinette! She’s the owner of Inspired Stamps and to see more of Antoinette’s wonderful art work as well as her fabulous design team please visit her Inspired Stamps blog. Antoinette is sponsoring prizes for this challenge! There will be 2 random winners drawn for an Inspired Stamps acrylic stamp set! You’ll have until October 4, 2011 to get your entries in for the prize drawing. Thank you Antoinette for sharing your awesome creativity with us! Darling card, love that striped paper. Very nice card with all the layers and texture it really has great depth. What a sweet Christmas card! Love the tree stamped on the music scored label! What a neat card! 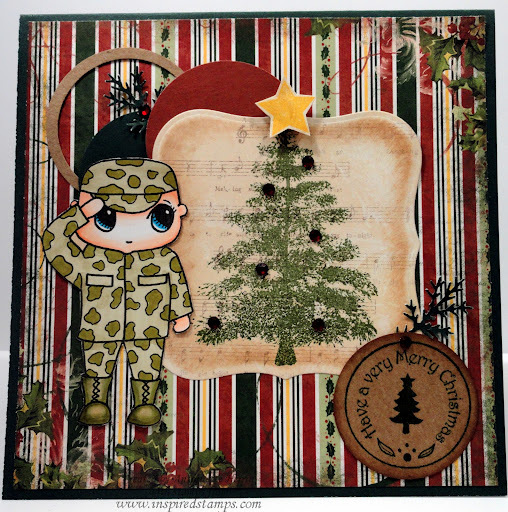 I love how you took the Christmas theme and added a touch of military. What a great card to send home! I love this style. The colors are beautiful together. I love the depth of the elements. The center focal point. Pretty enough to frame as a picture.